Starting with louis Armstrong and count Basie all the way down to lester Young and diZZie gillespie, Jazz ABZ is a spirited exploration of the lives and art of historic jazz greats. The luscious illustrations jump off the page to capture the energy and majesty of the music. Each artist is described using a poetic style chosen to match their musical style. (Haiku for the Thelonius Monk and Lyric poetry for Billy Holiday... plus there's a glossary in the back detailing each of the poetic forms and why they were chosen. This book is jam packed with useful information.) If you know someone who loves jazz, or if you love jazz and want to pass that love on to someone else, or if you're about to go on a hot date and want to impress that special someone with your esoteric knowledge of the life and times of Charles Mingus... this book has your name written all over it. Reader Challenge: The only thing that this book is missing is the actual music. My challenge is for a jazz enthusiast to create a playlist that includes one song from each artist that is truly indicative of his/her style. It would be great to be able to experience the visual art, the poetry, and the music all at once. Please? 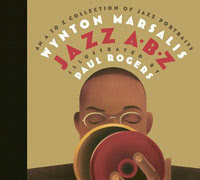 Extra: Here is a piece that was on NPR with Marsalis and friends reading from the book. The True Story of the 3 Little Pigs!